Welcome to Journeys and Adventures! A world much similar to our own. However, recently people with superhuman abilities have begun to appear. It would seem what was science fiction has come to pass! What amazing tales of wonder and adventure shall arise! This rp will have times when it spans the globe, but for the most part, at least initially, it will center around the fictional city of Maplevale, Kansas. The town's an up-and-coming city that's grown and expanded a lot with the new researches into sustainable energy and other fabulous technology, bringing in a booming economy and acting as a shining beacon for the rest of the US. This will be more in the style of graphic novels and comic books with heroes and the like that is going to be more chara driven, with stories and tales happening in regards to the people and how they move in the city with mini-arcs and a big central arc. RPers are encouraged to sandbox and make the word theirs--don't be afraid to try something. The worst I may say is that you need to edit this or that. I apologize for the vagueness of the plot, but I will see what my participants are like and go from there. I do have ideas, but like any great tale, they have to be adapted to the charas involved instead of a rigid story. I hope you will join me on this adventure and I look forward to rping with you. Writing style will be semi-literate paragraph format and the normal rules of GtR apply. Combat Skills: An excellent hand-to-hand combatant. However, he has been trained in traditional martial arts weapons of the katana, bo staff, sai, nunchaku, and escrima. Supernatural Skills: He can tap into his internal energy and use it to do phenomenal things: fly, superhuman strength, durability speed, stamina, agility, etc. He can channel it into energy blasts of devastating power, and he's still discovering new applications everyday. And he's increasing with power the more he uses it and trains. Back Story: Jericho comes from a normal home with loving, supportive parents. Though a loner by nature, he's always been well-received by his peers and teachers. He is smart, impulsive, with a joke and a laugh. Like all boys, he grew up dreaming of what it'd be like to be a hero and wishing he could be superhuman. To that end, in his mid-teens, he began studying martial arts and meditating, hoping to find the "internal energy" within. When he was 18, he succeeded, finding the energy within him and finding out the power it grants. Over half a year has passed since then and he's still trying to figure out this power and how to use it. Appearance: Normal: Sandy brown hair, pale green eyes, 5'8, 130 lbs; Powered up: Glowing golden hair and eyes. Combat Skills: A street fighter and a good one. Untrained until recently when Jericho began training her. She's good with a police baton, having stolen one from a cop on a dare and learned to use it. Supernatural Skills: She has a golden energy that she can use in a myriad of ways, from energy beam projection to flight. It also grants her enhanced physical attributes and she can see in various electromagnetic spectra. Back Story: Came from a small home, raised by a single mother. Her mom was always working, so she was very lonely growing up and mostly raised herself. As with any kid with free reign, she ran the streets, getting into trouble and seeking adventure. This resulted in her breaking into a research facility on a dare. They were experimenting with an experimental energy. She accidentally tripped over the wires and caused a fluctuation in the carefully controlled experiment, causing it to spiral out of control. The room exploded with her in it, but instead of being ripped to bits, the energy merged with her body, becoming part of her. Like any fun-loving thrill seeker, she went on a wild rampage, doing what she wanted--until she crossed paths with Jericho. A stray car she had sent flying had collapsed a wall that had fallen on and hurt his friend. She threw everything she had at him, but his martial skill surpassed her street fighting, and his own power was able to counter hers. She managed to escape before the authorities arrived--but the beating had brought her to her senses. She tracked down Jericho by his friend in the hospital. She apologized profusely for what had happened and promised to make amends. Jericho flat out told her to drop dead, but his friend hit him in the head with a bedpan, then forgave her, then told him to do the same. When he refused, she threw a vase at him, and told him that if he couldn't forgive, he'd at least give her a chance to make amends. Jericho, at the risk of having the nurses attack him, had no choice but agree. It was rocky, at first, but slowly a friendship formed, when she genuinely started using her powers to help others. She has often tried to get Jericho off the sidelines and join the fray, but he stubbornly refuses. I'll try it. Could be what I need to get me motivated again. I'll post a character or two later. Characters Pending: Daniel "Omniman" York, Holly Cross, Julia "Ms. America" Johns. Back Story: Tam is a girl trapped by her own family traditions. Due to having Japanese grandparents, the "joys" of arranged marriages still exist within her line--and of course, she's next. Every time she even thinks about it, eyes roll. Tam doesn't know which is worse, her family members, themselves, or the cliche continuity of her own life tragedies that come from her family. Having already finished high school, Tam was quick to jump into college as an excuse to thwart the rushing wave of delirious decision makers that are her parents. As long as she is still learning, they agreed that they would not be too hasty in their decision...which was more time for Tam to find away to make her own little escape. Within the University, which she is dwelling at alone away from her family, she is double majoring in Dance and Business Management. Dance is the only thing that interests Tam at all, but her parents simply would not allow her to enter college without a "useful, logical" major to go with her passion. She has been studying various styles of dance, including ballroom, hip-hop, salsa, and so on. As a student, her artistic classes have soaring grades, though all of those that file under the business category are usually just enough to pass the class, though not always on the first try. Tam's mother calls her "Tammy," whereas her father calls her "Tokako," after her middle name. Oddly enough, her parents are so different in how traditional they are into their Japanese roots--her mother being the more relaxed and American of the two. Nonetheless, despite all of the ways they differ, they both agree on marrying Tam off as soon as possible, so they simply aren't different enough for her tastes. Name: Elizabeth ‘Liza’ Farris, alias "Lightweight"
Appearance: Short at 5'4" and 110 lb, she has red hair cropped short in a pixie cut and green eyes. Energy Manipulation - Lightweight is able to draw energy from sources from the environment and manipulate it to her will - using it either to add strength to her punches or for long ranged attacks. This energy can be drawn from any source - sunlight, electricity, living creatures - so it tends to cause collateral damage, from a few wilted plants to city-wide blackouts. Liza’s mother was a scientist and a workaholic, and her father was the exact opposite – only working as much as he had to. Because of this, Liza’s mother still ended up working in the lab for some time while she was pregnant - this is likely what caused Liza to be born with the powers she had, latent abilities that awoke when she was very young. This power awoke in her when her father finally went too far, attacking her mother when she was about five years old. Five-year-old Liza stole energy from her father and used it to punch him across the room, after which she and her mother finally left him behind. She has a huge grudge against men like her father because of it, and so when she was twelve she decided to take up boxing as a way to learn to control her power (and her anger). She took up the name Lightweight when she was eighteen, taking out her years-old grudge on the criminals in her city. When she's not beating people up, she works as a bartender. Appearance: Tall and skinny, 6’2” with short cropped blonde hair and hazel eyes. Personality: Laid-back, sarcastic, friendly, a push-over, honest. Hobbies: Reading, puzzle games, sleeping, painting. Telepathy: His connection to the collective unconsciousness gives him access to anyone’s mind – with some effort and significant time spent sorting through it all. He can read thoughts and emotions of specific people with some effort, but can feel the emotions and general thoughts of a crowd casually. Mental Library: Connection with the Collective also, of course, gives him access to all the information ever learned by man. It takes significant time to sort through it all, however, and the more uncertain he is about what he’s looking for the harder it is to find. Ghost Sight: Humans that died, or creatures who never lived at all, are also connected to the Collective; those who haven’t fully passed on are still a distinct entity within the collective and still wander the earth, unseen by most. Terry’s exposure to it means that he is now able to see and communicate freely with these dead. Terry had a pretty normal life for a long time – two parents, a younger sister, dog, all they were missing was a white picket fence. He did okay at school, not really working as hard as he should, but he cruised through life in general well enough until he turned fifteen. Around his fifteenth birthday, Terry began to… well, hear things. For a while he thought he was going crazy until he recognized some of the voices – his sister, his parents – and more importantly, the information he was getting was not only true, but seemed to be coming from them. As time passed, he felt more and more voices opening up to him in his mind, the voices of his classmates and his teachers. Eventually he began to see things as well – dead people wandering the halls, who he was able to communicate with. A little research and experimenting led to his conclusions – somehow, he’d linked himself into some collective mind, and could access all the information stored in there. He took it surprisingly well, adapting quite well to his new powers and getting used to blocking out the buzzing of everyone’s minds when he wanted to. Currently he’s taking a gap year to figure out what he wants to do with his life. Name: Thomas Raine, Alias: "Cold Steel"
Steel Skin: Thomas can turn his epidermis into a layer of hard steel, assisting him in making harder blows and taking in more damage dealt by his foes. Although he has average speed and strength, the steel (when it covers him entirely) can slow him down while making him slightly stronger, as well. Target Link: This ability allows Thomas to share mentally link with a specific target. When he is linked with someone, he can sense their stress levels, specific moods, general location, and if they are hurt. This allows for him to know if this person is overly stressed, being attacked, anxious, panicked/alarmed, and other adrenaline-based moods. He can also track them, which is especially useful because this particular person cannot stray too far from him, or the strength and clarity of the link will fade as distance increases. Apathy: The steel of Thomas' skin is not as cold as most would like to believe--he is also known as "Cold Steel" because of his apathy. Though Thomas cannot easily empathize with those around him, he can take those emotions away, blocking not only the motions of others, but those of his own. Even the deepest and strongest of his emotions can be shut out for a time completely, allowing for him to become more pragmatic in his decisions or battling situation. Thomas has known of his abilities for many years--far beyond the time when general knowledge of superheroes reached the air. Before, "Cold Steel" was but an Urban Legend, heard of in rumors and darker stories. Now, however, the people of the world may be left to wonder if he isn't just a legend, after all. What is known through the stories is that this man has traveled from city to city throughout the world, acting as a Vigilante mostly by night as he faces down criminals of a particular sort: Mass murderers, serial rapists, and serial killers, to be precise. The stories, for the most part, are true. Thomas does hunt down these particular people, mostly because he sees them as the darkest parts of humankind. In fact, he has a very difficult time seeing them as human, at all. He has seen so many, found ways to search out patterns of these fiends, quick to catch a story that fits with his hunting needs within the news and other such sources. Due to all of the more colorful experiences with the crimes that he has both prevented and failed to prevent, Thomas has fallen to a darker void, sometimes losing hope for all mankind in today's society. His dreams are often haunted with even the sweetest civilians become like those that he hunts--worse so, he becomes one in his nightmares, enjoying taking the life of others repeatedly with no remorse, having mastered his apathetic ability with the utmost regrettable training. Because yes, I had to be different. I'll post her appearances later. Superhuman Physiology – Every cell in Julie’s body is essentially super-charged. She is superhumanly strong, durable, and fast. Her lungs are ultra powerful, allowing her to hold her breath for incredibly long periods of time as well as exhale gale force gusts. Almost all of her senses operate on superhuman level, allowing for amazing levels of range, clarity, and awareness or alertness. Flight – Julie is able to propel herself through the air and even float under her own power. Julie’s ability to fly seems to allow her to peak at supersonic speeds. Athleticism – For a time, Julie trained intensely to be an Olympic competitor. She is a remarkable gymnast and all around athlete. Martial Arts – Julie is a black belt in Karate. However, it's been heavily implied that she has "Photographic Reflexes", meaning she can easily duplicate actions she sees. This could be the reason she was able to get so good so quickly at other things. She didn't seem to have this prior to her incident, however, so it's possible that she's always had Photographic Reflexes and this simply evolved into a full Eidetic Memory after the fact. 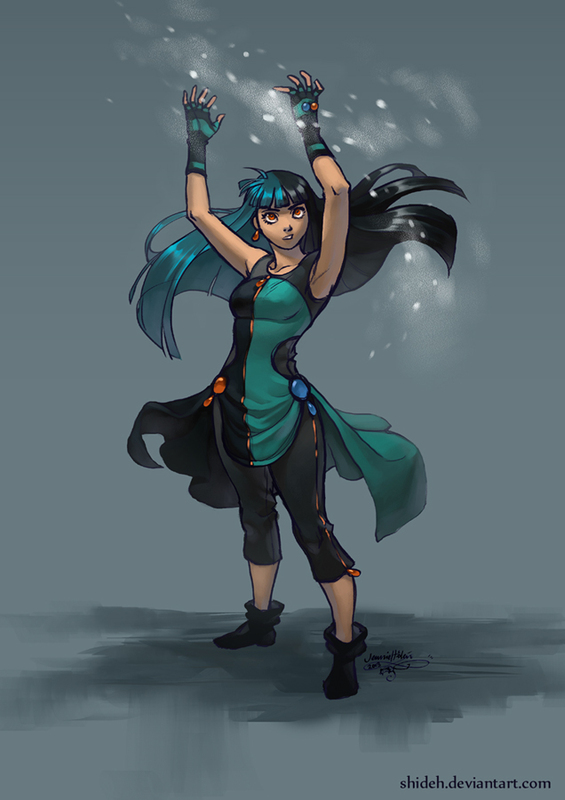 In any event, she is a skilled hand-to-hand combatant, though she tends not to rely on it much. Investigative Prowess - Julia's no master detective, but her deductive reasoning skills are worth note. Weaknesses – Despite her remarkable degree of augmentation, there are some fatal weaknesses. The first of which is the ability of certain types of projectiles made up of rare metallic alloy can hurt her, even pierce her skin. Bad Habits: Julie can be a bit clingy. Personality: Julie is a sweet, playful girl with a competitive inner spirit and a pleasant disposition. She’s personable and cheery and old fashioned, having been brought up on old fashioned small town values. She knows how to take charge of a situation and make the best of it. History: Julia grew up in a small town in Kansas, in a single parent household, helping to raise three younger siblings and a cousin. Because her father was alone and worked two jobs already, she had to tend to everyone’s needs. But she always looked forward to a bright future, in which she would be able to participate in the Olympics. Her family was supportive and her father raised her to be a fine young woman. But her dream never really came to fruition, much to her inner displeasure. To this day, she still wonders if she might have been able to win, should circumstances have turned out differently. Julie was also the defensive wall of the household. She was the oldest and the only one who learned how to fight. She even maintained jobs babysitting and doing yard work for people, among other things. When one of her little brothers was being bullied or her little sister or cousin was being picked on, she’d be standing by to run down whoever was responsible. Julie attended college in the city a bit late thanks to her need to stay supporting the household. But she was still urged to go by her father who assured her that he could take care of them himself and that she should plan ahead for a bright future. Life in the city was much different. Everything was so much faster paced and energetic. She felt out of place and homesick, even staying with a family friend. Julie’s life wouldn’t change forever until a point when she had been search for her own apartment. A freak accident winds up irradiating her entire body, super-charging every one of her cells. Upon later discovering the resulting powers, she came to the conclusion that professional competition wouldn't be fair. She was forced to abandon her old dream of competing in the Olympics, much to her dismay. Julie wouldn't become a superhero until later, when investigating the ransacking of her apartment and kidnapping of her roommate. Following her success in managing that, she found the nearest thing she had to a costume and began to go out in it. People began to refer to her as Ms. America, due to its color scheme. Ethereal Empowerment – Danny’s powers are drawn from a connection to “The Ether” which is a plane of existence where the life force of an individual takes the form of physical energy. The stronger the energy in an area, the more powerful Omniman becomes. When the Ether is bolstered with Willpower and Hope, Omniman’s power is at its peak. This is the reason that Omniman works so hard to encourage the people of Silver City to have faith in him and always hope for a better future. It makes him more powerful and he can more effectively defend the city this way. Superhuman Physiology – Omniman’s strength, speed, durability, and overall physical ability is proportional to the power he draws from The Ether. At his peak, Omniman has earned the title of “Earth’s Strongest Man.” However, whether or not this is true has yet to be proven. It's just a label. It is not out of the question that stronger heroes and villains exist. Ethereal Energy Emission – Omniman can harness Ethereal Energy and project it in the form of beams, volatile bursts, and pulses/waves. He can concentrate the heat generated by it, as it is normally only warm and not hot enough to burn, simply impact. Life Force Sense – Omniman can detect disturbances in the Ether. Specifically, he can detect when individuals at a certain range are in states of high distress, lent to dangerous and life threatening situations. Healing – Omniman can use Life Force energy to heal others but the effect of this depends on how much power he has to use. This tends to weigh heavily on his power for a few minutes or even hours. How much power he has to use and how long it takes depends on the extent of the injury or stage of the illness. Flight – Omniman can propel himself through the air under his own power. Intellect – Omniman is actually highly intelligent. Strategic Mind – Omniman is an expert strategist and tactician. Kickboxing – Omniman is a skilled brawler. Investigative Skills – Despite people believing Omniman to just be a brick that muscles his way through everything, Omniman is actually a very capable investigator, gifted with expert deductive reasoning skills. However, he is no investigative genius. Just good at what he does. Ethereal Empowerment – Unlike most other Ether Conduits, Omniman is actually weak to a specific other form of Ethereal Energy. He is particularly vulnerable to the energy produced from Hatred. In the cases of Anger and Fear, he is neutrally affected. He is not weak to them, but not strong against them either. Also, Omniman’s charge is not absolute. Greater displays of his power require greater amounts of his stored energy. As a result, Omniman is generally more effective when in close proximity to high concentrations of the specific Ether Energy that fuels him. For this reason, he works hard to try and instill a sense of hope in the citizens. Syntheum Cape – Omniman’s cape uses a material called Syntheum, created by Bradshaw International (you'll see). It is incredibly durable and flame retardant, as well as being capable of acting as a radiation shield. Omni-Belt – Omniman’s belt is hidden by the sash he wears. On it are various gadgets that he regularly uses to maximize his efficiency. These include trackers and experimental power dampeners. Omni-Mask - The eye-shields of Omniman's mask are Multi-Spectrum viewers, enabling normal vision, X-Ray, Infrared, etcetera. Monetary Situation - While Danny is fairly well off on his own, being able to afford a decent condo in the city, he also benefits from a company he'd set up. "Omniman LLC". Using this, media outlets wind up resulting in Omniman gaining money on TV and with photos taken of him. By running the money through a number of shell companies to hide the trail, Omniman is paid under an assumed name. This money goes to charity, helps fund his job as a hero, and acts as monetary compensation for any legal action possibly filed against him. Such as someone deciding to sue. 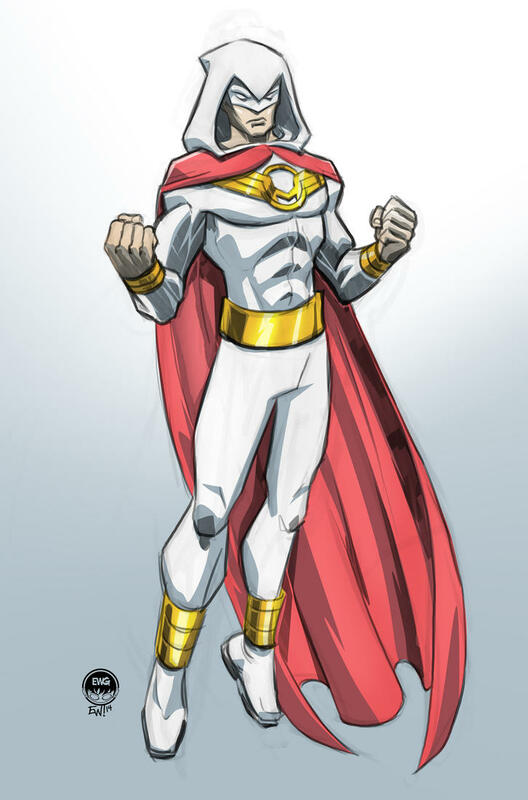 Personality: Omniman is one of the most powerful human beings alive and that is something he is fully aware of. He remains humble and doesn’t allow it to go to his head. However, that doesn’t mean he can’t showboat every now and again. It helps to think of Danny as Clark Kent if he grew up in the harsh inner city environment and was picked on as a kid, and not a small town in the middle of nowhere Kansas where everyone was okay with him. But he was still surrounded by loving parents. While every bit as morally driven as the classic paragon, Danny is different in that he has a bit of a chip on his shoulder. He's more cynical and his personal viewpoint is that of someone who hopes for the best but expects the worst. He knows that people are afraid of him, and he can see why. But he also wishes to show them that they have nothing to be afraid of. He wants to be an inspiration and wants to make sure everyone gets an even chance. He also hates bullies of any kind, and doesn't turn a blind eye to the bullying of people running the country. And while he acknowledges that there's nothing he can do about it, he makes no secret of his disapproval of certain political figures. He's aware that they'd love to keep him and those like him on a leash, but as much as he won't that happen, he'll agree to cooperate WITH them, if it's for the best. He respects law enforcement, though isn't ignorant to the shadier sides of it and, using his investigative skills, will campaign to weed out police corruption if he notices it. In short, Danny may be a bit embittered, but he refuses to allow that to grey his resolve. Where he is concerned, there's good and there's evil. Right and wrong. Black and white. He believes that the world is only as complex as we make it. So why not make it simpler? History: Danny grew up in a run down neighborhood in a not-so-pleasant city, coming up in a boarding house, home to number of very colorful people from various different backgrounds. And while each of them amused him and contributed to his growth in their own right, he admired no one more than his father. Danny and his father had an incredibly strong bond, which allowed Danny to get himself through the rather miserable days putting up with life outside of the boarding house walls. Street kids would pick on him for his small stature and the fact that he spent so much of his time with “old folks.” They’d sabotage him in street games of kickball or hockey or even in school, and generally harass him on a regular basis. Soon, however, something awoke in Danny that he’d always felt but never could explain. He discovered a newfound strength and all manner of other abilities began to awaken. His speed, resilience, and jumping ability were soon found to be abnormal for a boy his age and size. His father feared the worst, urging him to hide this part of himself. But as it became more and more apparent what his son was going through, and after he got into a fight at school and badly beat the bully, he sat Danny down and had a talk with him. Whatever these powers were, he feared that the world would either fear him or try to take advantage of him. He taught Danny many valuable lessons, growing up. But this was the time Danny would first have to question the type of man he was going to grow up to become. Late into Danny’s adolescent years, his father is diagnosed with cancer. During this period, Danny visits him often and does a great deal of reflecting, hiding his powers for the time being. When his father finally passes away, Danny decides to take it upon himself to stop putting off answering his father’s question. He knew the kind of man he was going to become. 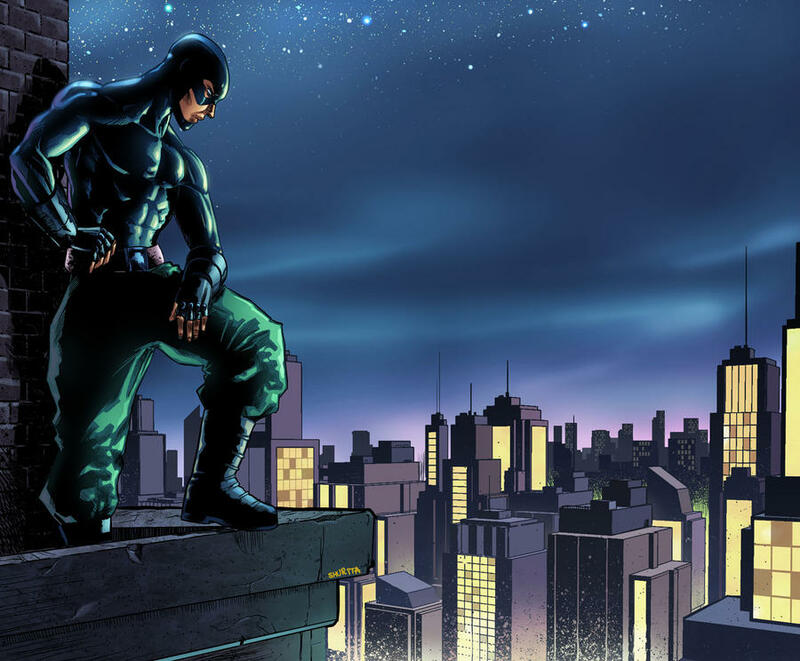 Over years of preparation, Danny hones himself, figures out more about his powers and establishes some worthwhile connections with people, including Edwin Lennox, a researcher who helps him learn more about his abilities, and other characters who would help him improve his arsenal of skills, knowing that his powers, alone, can’t be relied on. Danny moves to Maple after he establishes himself as a notable architect and general contractor with a good list of connections, given the city’s progressive atmosphere. He debuts as Omniman later. Danny's powers are the result of his father's past as a war vet. He and his unit were captured by an unknown enemy, presumably not of any party in the war. There they were used for test subjects. He was eventually freed, but very few of his men survived. In the return, doctors could find nothing wrong (no tools capable of detecting meta mutation), so he was in the clear. He soon left the military, starting a life with sweetheart, Joan and thus, Danny was born. While Martin never manifested any form of superhuman abilities, the traits passed on to Danny were something refined and perfect, making him the success that the terrorists were looking for, but failed to get. Superhuman Physiology – Wild-Child boasts greatly enhanced strength, durability, endurance, speed, agility, dexterity, and reflexes as well as significantly enhanced senses, all presumably to the levels of various animals. Night Vision – Wild-Child can see in the dark with the utmost clarity. Dual Mind – After discovering that Wild-Child’s feral rage was actually the eruption of a dormant spirit within her body, it became clearer what it was. “The Prowler”, as it’s come to be known, is a fearsome beast spirit that overtakes the mind of its host, greatly increasing what has already been enhanced and also adding a more instinct driven nature for a time being. In this persona, reason is little more than a lightly put suggestion as it will hunt its prey until it has ravaged it. It is presumably a force meant for good and protected many a jungle, forest, savannah, and so-on for some time before disappearing. However, Wild-Child isn’t so sure. It is relentless and savage. She doesn’t see how something so wild and uncontrollable could be a force for good. This beast is unleashed when Ren is enraged. Free Running – Wild-Child has mastered the art of free-running along the rooftops and walls of the city. Sixth & Seventh Senses – Wild-Child can detect danger and weather patterns, well ahead of human standards. Pouch Gloves – Renee’s gloves are akin to the utility belts that other superheroes wear. There are numerous pouches around the wrists, each with a different designated load. Also, eventually she upgrades the gloves themselves, so that they now come with retractable claws, strong enough to let her cling to, and scale walls. Pods – Wild-Child developed her trademark weapon of choice, herself. She carries small pods around that fit in the pouches of her gloves and have varied effects such as releasing a restricting solution that expands when exposed to oxygen and restricts more as whatever is trapped in it struggles. She also has pods that detonate with enough force to knock a person back. Some of her pods release knockout gas and others release a hallucinogen. “Snap Lashes” – Wild-Child’s gloves are also outfitted with a mechanical wire-shot that contains several yards of compressible wire with tremendous tensile strength. When ejected, they coil together into a thick cord that fans out towards the end. The tips have innumerous microscopic hooks that allow the cord to adhere to virtually anything. Renee uses these cords for swinging, yanking, and as combative whips. Fears: Ren’s greatest fear is that she’ll lose her mother the same way she lost her father. Desires/Ambitions: Ren seems to be at a loss for what path she wants to take in life. Bad Habits: Ren is rebellious and prone to ignoring her mother; she falls asleep in classes and shirks responsibility rather often though she is trying to do better with all of this. She tends to let things bother her for long periods of time. Personality: Ren isn’t known for letting things go. Since her father was killed, she finds it difficult to get over things. She’s also stubborn as a mule and doesn’t take kindly to authority, especially when she thinks she’s right about something. She’s incredibly vocal and argues often with her mother. She loves her but she’s a somewhat cynical teen who, at the end of the day, just wants to be left alone to do her thing. Renee uses her Wild-Child gimmick as a means of blowing off steam and just being free to do as she pleases. While it may not have been her intention to become a superhero, circumstance keeps dragging her back into that direction, especially given the genuinely kind person that she is. Renee is a bit of a reluctant genius. Everyone knows she’s insanely intelligent, but she often ignores that gift, rather than embrace it. History: Renee’s father was gunned down in the line of duty when she was twelve. Ever since then, she’s closed herself off and made it difficult for anyone to really understand her or be close to her, including her own mother. When Renee goes on an African Safari field trip to get away from her mother and the torment of school, she wanders from the trail when she sees something interesting. She is accidentally shot by a hunter, who leaves her there to die. A local finds her, however, and patches her up. He forges a potion for her and once she receives it, she is essentially revived, and her wounds heal miraculously in a matter of minutes. When Renee returns home, she finds that she is feeling strange. She discovers her abnormal strength and ultra sensitive perception. Soon she discovers her other talents and not long after, she becomes a street-level superhero to take out her frustrations on the scum around the city. Wild-Child’s efforts improve significantly after she decides to apply herself more and start using her mind to design most of her gear and she creates a new costume for herself among other improvements. She would continue to make improvements to her alter ego as time progressed. Symbiosis – Whitney has a symbiotic connection to her car, Blackbird, which is actually a paranormal battle wagon, of sorts. Demon Arm – A portion of Blackbird's presence is located in the black gem of the bracelet grafted to Whitney's left wrist. This arm possesses a portion of its creator's supernatural abilities. Umbra-Kinetic Strikes, a burning touch upon those who've spilt innocent blood, fear inducement (through use of the Black Ash that also composes Blackbird). Paranormal Sense – Whitney can sense the presence of ghosts, nigh-demons (demons from the Nightmare Dimension), and other supernatural (not to be confused with magical) entities, then hone in on that sense for the ability to see and hear them. Mechanic – Whitney is an incredibly skilled driver and mechanic, with a staggering aptitude for vehicles. Martial Arts – Whitney’s father was a military bigwig and later became a high ranking CIA Agent. He saw to it that his daughter learned how to defend herself. She has taken up fighting as a bit of a hobby, learning multiple styles of unarmed combat and having proven to be an exceptional combatant. Investigative Mind – Whitney has studied criminology and crime on a very intimate level. One could say that she’s obsessed. But it has led to a very keen understanding of the criminal world. Demon Arm - While not actually demonic, the dark power used to create Blackbird is still inherently evil and has not been wholly purified. Because of this, the more often this Demon Arm's abilities are used, the more Whitney's blood fills with "Black Ash", turning her veins black. This results in the occasional voices in her head, among other things, as the corrupting influence of this power grips her. Blackbird – Blackbird is an entity unto itself. A paranormal creature with a symbiotic connection to its chosen Valet. Blackbird has a large host of abilities, being comprised of Ash and Hellfire. It can alter its shape into a wide variety of appearances and generate attached constructs of ash and hellfire. It can also warp space, becoming bigger on the inside than on the outside. Blackbird can even defy many of the laws of nature, allowing it to ride on the surface of water (by generating a road of solid hellfire), on vertical surfaces and upside-down, and accelerate to Mach speeds. Blackbird can also decompose into a cloud of ash and recompose itself where it wishes, regardless of how far apart the ashes might get spread. Furthermore, it is fully capable of driving itself. Blackbird is a sentient being, and has emotion. It can speak, telepathically, with its selected Valet. It prefers to be referred to as Female, as well, and is most commonly seen in the form of a ’67 Pontiac GTO. It’s been suggested that Blackbird’s personality changes from driver to driver. Blackbird can open rifts into the Nightmare Dimension, which it can then send victims to. Personality: Whitney isn’t a people person. She’s only ever gotten along with her family. She prefers the company of books and machines. When she speaks, she has a tendency of being rather awkward. She is actually a rather strange woman, and very quiet. When acting as The Valet, she speaks even less often, preferring to let her actions do the talking while her targets cower in fear. Absorption – Assym’s race is unique in their ability to absorb and mimic virtually anything, from elements to physical traits, to abilities and knowledge. This is actually not a trait they originally possessed, however. In the early stages of their society, experimentation led to the evolution of the species in an attempt to make them indestructible. This proved to be almost completely successful. Combat Training – Assym is a trained scout, with years of experience in combat, both armed and otherwise. Cyber Warfare – Assym is trained to be a skilled intelligence agent, top top-of-the-line hacking talents. Absorption – There are limits. Assym is not able to absorb magical energy or anything produced by it, including mystic lightning, fire, etc. Also, if she begins to mix different absorbed attributes, then she may dilute the properties, reducing the effectiveness of each trait individually. She can presumably only house ten foreign traits at once. Knowledge, she can retain indefinitely. Ship – Assym’s base is her hidden ship in a mountain near Apollo City. Personality: Assym appears to be a very tortured soul, filled with nothing but hatred for mankind. Yet, at the same time, it implied that she isn’t without remorse, and is weighed down by some manner of guilt. Assym was found, very recently, tucked away in a hidden level of Area 51. She is often recorded as having been their first alien “guest,” having been encountered over 50 years ago. She was quickly captured and has been on ice for decades. Despite having finished researching her, they kept her on ice for all that time, only to have recently been woken up by a freak accident in the base, where she broke free and fled. Later, she resurfaced, broiling mad and ready to take out her frustration on the people of Earth. Appearance: 5’6”, athletic build. Medium-length hair that is dark brown with light brown highlights. Brown eyes. Persuasion: Ability to influence people and force them to do her bidding. While her ability is quite strong, she cannot make a person do something they are physically incapable of. The victim will not remember that she persuaded them and will remember that it was completely their decision to make. Precognition: Ability to see potential futures and outcomes. Not as controllable as her persuasion. It mainly activates when she is in a dream state or when in danger; however, if she concentrates strong enough, she can will herself to see possible events. Bree was an only child and grew up in a military family. The lifestyle was strict, controlling, and often meant traveling from base to base. She never had a real home due to their constant moving. Her father was tough on her and pushed her to be better, causing her to feel as though she never met his standards. These feelings eventually turned into resentment of her father and led to her becoming rebellious and secretly start hacking into her father’s military files. During this time, Bree’s abilities began to manifest. While Bree and her father bumped heads from time to time, her mother held the family together until she died in a car accident that a 17-year old Bree foresaw and actually caused. After her mother’s death, Bree used her abilities to persuade her father that she died in the car accident and she took off. She has been living on her own, only living in a city for 6-7 months before moving on. She currently has been living in Maplevale, Kansas for 2 months.